Former NASA space shuttle pilot CJ Sturckow left the space agency to join Virgin Galactic. Just a week after Virgin Galactic made history with its first rocket-powered test flight, the commercial spaceflight company announced that it is hiring two veteran pilots, including a former NASA astronaut, who will help bring space tourists to new heights above Earth. Retired U.S. Air Force Lt. Col. Michael "Sooch" Masucci and former NASA space shuttle commander Frederick "CJ" Sturckow will work out of Virgin Galactic's Mojave, Calif., location to conduct flight training and testing with the suborbital SpaceShipTwo and its mothership, WhiteKnightTwo, the company said in a statement. "CJ will certainly be missed by the Astronaut Office," said Bob Behnken, chief of the Astronaut Office at NASA's Johnson Space Center in Houston. "He was a role model for leadership, and his expertise as an aviator and shuttle commander led to the success of the shuttle and station missions. His experience in spaceflight and ground operations will be difficult to replace within our organization. We look forward to his continued contributions to the future of spaceflight as he moves on to the next phase of his career." Masucci, meanwhile, is an experienced test and combat pilot who has logged more than 9,000 flying hours in 70 different types of airplanes and gliders. A suborbital trip aboard SpaceShipTwo promises to bring passengers to the edge of space and back for $200,000 a ride. The flights would not make a full orbit of Earth, but they would allow passengers to experience brief periods of weightlessness and glimpse the planet from space. New Virgin Galactic pilot C.J. Sturckow, a four-time space shuttle astronaut, gets a traditional dousing after flying the company's WhiteKnightTwo mothership for the first time on May 9, 2013. "Viewing the Earth from space is such a unique and unforgettable experience," Sturckow said in a May 8 statement. 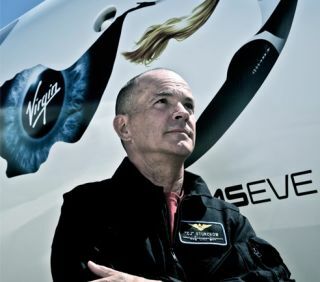 "I'm excited to be a part of the Virgin Galactic team that is revolutionizing access to space, making this opportunity a possibility for all." Virgin Galactic, founded by the British billionaire Sir Richard Branson, held its latest, and 26th, test flight of SpaceShipTwo on April 29 at California's Mojave Air and Space Port. Virgin Galactic officials have said that SpaceShipTwo could carry passengers as soon as this year or 2014. More than 500 people have signed up for the flights, which will be run out of Spaceport America in New Mexico once the testing phase is complete. Follow us @Spacedotcom, Facebookor Google+. Originally published on SPACE.com.